The thing about quiet people is that that they run the risk of getting overlooked. Not that I would know anything about that from personal experience, heh heh. The Honda CBR650F, though, is emblematic of the problem. The CBR650F arrived in India almost four years ago and we liked riding the Honda too. But it entered a segment with high profile motorcycles like the Triumph Street Triple and Kawasaki Z800 (now the Z900) and it didn't make much of a ripple. And yet, the chaps who found the Honda Wing Worlds and got one are quite happy with their CBR650Fs, the sensible, civilised mild sportsbike. And now Honda has gone and upgraded it. Visually the big change is the new skin. The body work is mildly reworked and at the head of things is the smashing new all-LED head lamp that is at once thoroughly modern and unmistakably a Honda design. This package is offered into two colours. A Honda red-based design with black and white stripes that takes over from the older white-based scheme. And this smashing frozen black with a minimum of red highlights. It looks extremely eye-catching in the black I must say and you'll get lots of second glances and appreciative nods, promise. Under the skins are relatively minor changes. Honda has a new airbox and configuration although the inline four and all the hardware remain unchanged. That one change though raises both peak torque and power by a modest margin. But Honda says the mid-range has improved quite a bit. Also new is the suspension. The pre-load adjustable rear monoshock is now matched to a pair of pre-load adjustable Showa Dual Bending Valve (SDBV) forks. Let's ride, shall we? The Honda 649cc 16v DOHC inline four feels extremely familiar. Now making 89PS, it's an extremely familiar engine to say the least. What I mean by that is this. If you close your eyes and imagine what a street-legal Honda inline four should sound like that, you will know exactly what the CBR650F sounds like. It's uncanny accurate and its also perfectly pitched in how the sweet presence of the four-cylinder at low revs transforms into a more urgent muted roar closer to redline. It certainly slightly more vocal than the old bike. And to ride, it's all sweetness and light. Up to about 5,000rpm. Below that, the Honda is utterly refined and completely vibration free. Unfortunately, around 5,500 and below aboput 6,500rpm, the Honda engine is a bit buzzy, just like the old one. This is the rev range where you would normally accomplish the majority of a highway cruise and that will be a niggle for sure. But past 7,000 the engine smooths out again right up to the redline. Rev it out with intent and the Honda is quick 0-100kmph takes 4.82 seconds. And yet, it refuses to feel quick. Power arrives in an utterly linear, almost boring fashion and you never sense the motorcycle's speed. It's a very Honda thing to do and you will often find yourself far north of your inner safe speed without realising it as you get used to the CBR650F. And if you go easy, just take a look at those economy numbers - they're good! The flip side of this quietness and civility is that the Honda can feel a little less engaging than some of its more lively peers - we will come to that in a bit. Just like the engine is a well-balanced package, so is the dynamic package. 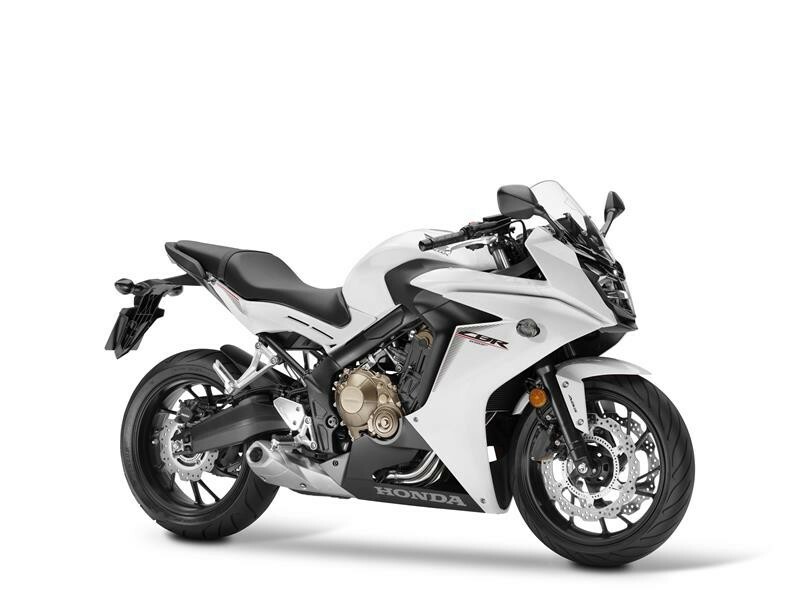 I don't think you can call the Honda CBR650F outright sporty, like say, the CBR600RR. And yet, it goes around corners with confidence and accuracy. It's a set up that keeps fast riders satisfied and new riders calm and collected. In some ways, that's exactly the sort of role-goal these mid-displacement machines have. While you can get better tyres than the Dunlop Sportmax, the CBR650F is wonderfully stable and neutral in the corners. Ride quality is a stand out for me. Ride it mildly, as you might in the city, and the CBR650F feels uncannily smooth and absorbent. It's almost as if Honda forgot it makes motorcycle and build a LaZBoy instead. Full credit for Showa, their recent suspension products really have been special. Once you pick up the pace, the CBR650F refuses to descend into wallow or feel too soft. As the pace picks up, the Honda continues to feel composed though the suspension isn't quite so plush any more. The 2018 Honda CBR650F uses Nissin sliding calipers up front. Note how the clever design of the wheel removes the need for a disc carrier and saves some weight. The brakes are solid. ABS is standard, the bite is well-judged and fast-hard stops require no undue effort, nor do they happen with any drama. I do wish Honda had pushed the design of the CBR650F further towards their current European ethos. The updates do make the CBR looks smarter than the old one and it isn't just a matter of the reasonably powerful LED head lamp either. But when you look closer you realise other things - the twin display LCD clocks looks a little bare and omit stuff that's almost hygiene in the segment now, like a gear position indicator. On the flip side, Honda's quality and finish levels look as great as ever. What I would change as an owner are the tyres as soon as the OEM Dunlop Sportmaxes are finished. They are okay but I can think of other tyres from Michelin, Pirelli and Metzeler which would all offer more feel and grip than these. If you're looking for capable but mild-mannered, friendly motorcycle that does many things really well, especially around the city and on short highway rides, the Honda CBR650F is for you. It isn't the most involving motorcycles in its price segment but it's every inch a Honda. The Honda CBR650F is assembled in India and the price, at Rs 7.3 lakh ex-showroom, is not the cheapest. And that is a bit expensive. For example, the new Suzuki GSX-S750 offers almost 15PS more and traction control for about the same price. The Honda CBR650F is on sale now and we're wishing and praying that it's cheeky brother, the CB650F is in the wings, just waiting.